Elizabeth is a graduate of the University of Arkansas School of Law. 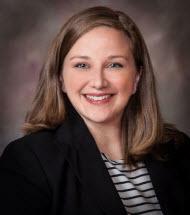 While in school she worked in the Law School Legal Clinic on step-parent adoptions, guardianships, and for the Arkansas Innocence Project as a Student Attorney, and as a Student Coordinator. Before law school she earned her B.A. in Environmental Science with Minors in Biology and Pre-Law, from Westminster College (MO) where she founded the school's Chess Club and EcoHouse, a sustainable learning and living facility and internship program for students on campus. Her father is a retired colonel who served in Iraq, Afghanistan, the Gulf War, and Vietnam, so she has a particularly special place in her heart for veterans and especially for their families.